Owing to the vast experience in this field, we are engaged in offering high quality Plug Key One Way to our valuable customers. This product is equipped with an accurately tapered plug and fluted top that fits into the tapered hole between the two blocks, ensuring very low contact resistance. With Brass blocks of 9mm rectangular in shape with all brass terminals and screws. Being a customer oriented organization; we are deeply engaged in offering a wide array of One Way Plug Key. - Same as above but with brass block of 12 mm thick mounted on a heavy bakelite base provided with all brass terminals. Thick brass of 10.5mm fitted on heavy bakelite base provided with all brass terminals and screws. Plug key one way , two ways and three ways are made of brass and fitted on plastic base with the help of screw and terminals. 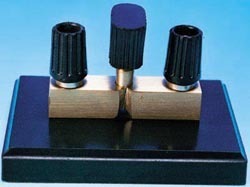 Plugs are provided to make the flow of current. On bakelite base with brass terminals. 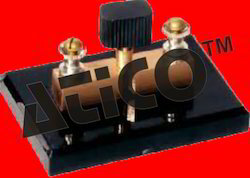 TWO WAY PLUG KEY: With brass blocks rectangular with brass terminals . The brass plug and lugs are thoroughly interlaped for perfect locking. The plug head is machine moulded. With three brass blocks, each with a 4mm insulated terminal and two standard tapered plugs to fit the two holes between the blocks.